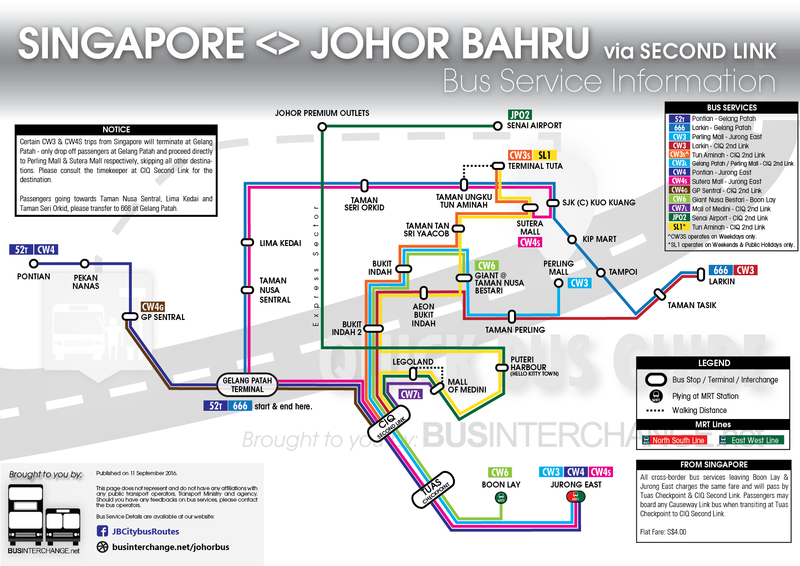 Travelling to Singapore by public transport from Johor Bahru (JB)? Below are the tips on how to get there! Before that, let's first take a look at the live traffic situation at the checkpoints. 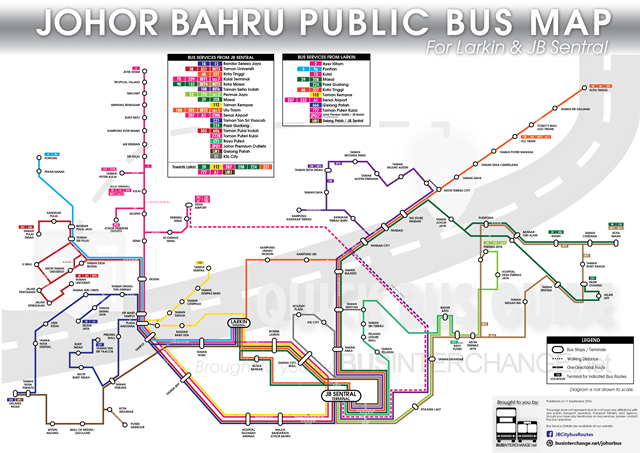 Overall Easy Diagram of the cross-border bus network via Woodlands Checkpoint. Basically, all bus services going to Singapore via Woodlands Causeway will start from either Larkin bus terminal, JB Sentral or Johor Bahru Checkpoint (CIQ). Passengers travelling with Causeway Link may board either CW1, CW2 or CWL and purchase a ticket to Woodlands Checkpoint, Kranji, Queen Street or Newton Circus on board the buses. Under good traffic condition, the bus journey from Larkin to JB CIQ could be as fast as 15 minutes. However, the entry of the checkpoint are often congested with cars during peak periods. Do allocate extra travel time for this stretch of route when you are planning for your trip to Singapore. Payment by Ez-Link Card is accepted on SBS Transit bus 170. Fares will be deducted in Singapore Dollars, in accordance to the distance fares as approved by Singapore's Public Transport Council. Payment by Manjalink Card is accepted on Causeway Link CW1, CW2 and CWL. Fares will be deducted in Malaysian Ringgit for trips beginning from Johor Bahru. To Queen Street (Bugis): RM3.40 (for Causeway Link buses and SJE), S$2.60 (for SBS Transit 170). To Newton Circus: RM3.40 (Causeway Link buses). To Kranji MRT: RM1.90 (Causeway Link buses), S$2.30 (SBS Transit 170). It is advisable to walk from JB Sentral to Johor Bahru Checkpoint (JB CIQ). Walking into the immigration complex would take about 5 to 10 minutes, which will help you to save some time, as compared to taking a bus from JB Sentral bus terminal. 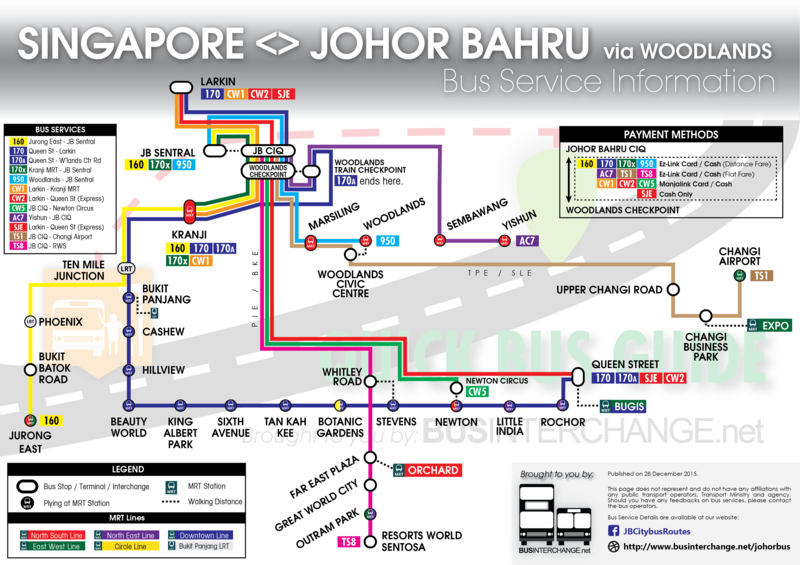 Nonetheless, there are three routes SBS Transit bus 160, 170X and SMRT bus 950 from JB Sentral Terminal to JB CIQ. Be sure to stand near the road for boarding. These buses will generally pass by the terminal as it is usually packed with buses. Note: Children under 7 years old or below 0.9 metres can travel for free. Note: Half price is applied to children from 7 to 12 years old, students in primary or secondary school uniform, senior citizens from 60 years old and disabled persons. Children under 7 years old can travel for free. Note: 25% discounted fare is applied to children from 7 to 12 years old, senior citizens from 60 years old and disabled persons. Children under 7 years old can travel for free. Note: Half price is applied to children below 7 years old. Passengers may board any Causeway Link buses at Johor Bahru Checkpoint and make payment for the full fare to the intended destinations. For example, a passenger going to Kranji MRT may board a CW5 bus and purchase a CW1 ticket to Kranji MRT. Buses operated by SBS Transit and SMRT Buses accepts CEPAS Ez-Link Card and deducts distance fare as approved by the Singapore's Public Transport Council. During a traffic congestion, passengers may choose to walk to Woodlands Checkpoint. Walking to Woodlands Checkpoint will take about 20 - 30 minutes, depending on your walking speed. Do note that if you are beginning your bus journey from Woodlands Checkpoint by AC7, CW1, CW2, CW5, TS1, TS3 or TS8, bus fares shall be paid in Singapore Dollars, fares from JB CIQ will no longer be valid. For cash paying passengers, please present a valid ticket to continue on the bus journey from Woodlands Checkpoint. Alternatively, you may walk out to Woodlands Train Checkpoint for other buses connecting to your Singapore destination. Several Causeway Link bus routes connect passengers from the western side of Johor Bahru to Singapore through the Second Link. Passengers travelling to Singapore from Bukit Indah are recommended to board the buses at AEON Bukit Indah or Giant Nusa Bestari, as most of the buses may already be fully packed when leaving AEON or Giant, especially during weekends. Please note that CW3E will ply via Sunway Iskandar before heading to CIQ Second Link. CW3 and CW3L is the fastest route from AEON Bukit Indah to CIQ Second Link. It is recommended to wait for the bus to Singapore at Gelang Patah Terminal. With the new terminal being built, it is a more comfortable experience to wait for the bus at the terminal than at the bus stop at Taman Nusa Perintis. Besides, buses departing Gelang Patah Terminal for Singapore may already be fully packed, and may no longer pick up more passengers along the route. With huge car parks built next to Mall of Medini, drivers could look forward to save the toll fees at the checkpoints by parking their cars there and hop on to a Causeway Link bus to Singapore. Frequent departures for Causeway Link CW7 would bring more convenience to commuters. Note: JPO2 operates with a 3-hour interval. Direct bus routes to Singapore via Second Link are available from Pontian bus terminal and Jalan Pontian at Pekan Nanas. Alternatively, to cross the checkpoint at Woodlands, please take Maju express bus 96, or Transit Link JB bus 3 to Larkin. For journey from Larkin to Singapore, please refer to the first section of this article. Causeway Link JPO2 offers a direct service to Singapore via Second Link. However, please take note of the bus timetable as JPO2 operates at a 3 hour interval. Alternatively, travelers can choose to go to Singapore via Woodlands Checkpoint. Causeway Link offers a express bus service AA1 from Senai Airport to JB Sentral. Travelers disembarking from an Air-Asia flight are able to purchase the add-on service at only RM6.00, for a direct bus service to CIQ Johor Bahru to travel to Singapore via Woodlands Checkpoint. This service is only available for purchase during the booking of air ticket, and cannot be purchased over the counter at Senai Airport. Alternatively, travelers can choose to go to Singapore via Woodlands Checkpoint. Causeway Link operates bus service JPO1 from Johor Premium Outlets to JB Sentral. Causeway Link buses CW3E, CW3S, CW4G, CW7L & JPO2 will turn back to Malaysia at CIQ Second Link, after dropping off passengers for immigration clearance. Tickets to Singapore can be purchased onboard all these bus services. After immigration clearance, the same ticket could be used to board CW3, CW4, CW4S, CW6 & CW7. Passenger boarding CW3, CW4, CW4S, CW6 or CW7 from CIQ Second Link without a valid ticket can pay for the fare of RM2.60 to travel to Boon Lay, Jurong East or Tuas Link. Passengers are not allowed to walk along the highway to Tuas Checkpoint. Passengers are not allowed to walk out of the checkpoint. Passengers boarding CW3, CW4, CW4S, CW6 or CW7 at Tuas Checkpoint without a valid ticket can pay for the fare of S$2.50 or RM6.00 to travel to Boon Lay, Jurong East or Tuas Link.